I get an error message when i try to connect to AWS using the preview linux client. Sometimes i don't get this message and it works without problems but most of the times it fails. It always works the 1st time i try to connect but later it fails. I have to delete the configure files to get it to work again. I'm using AWS authentication based on some external Active Directory with MFA. I see...we have not be running the client in docker much...let me switch to that setup and see if I can reproduce this. @obadz can you post the log from just before the lines you have posted? I'd like to see the XML message sent to the PCM. Also if you have the same log lines from a time when it was successful. I'd like to understand if the client is sending a different message or the PCM is responding differently to the same message. @luis are you trying to connect directly to AWS or have you setup a Connection Manager for AWS? Direct connections (without CM for AWS) are still in development and you may be hitting an error we have not yet handled. To use the new direct connection to AWS feature please enter the AWS registration code in place of the Connection Manager address when creating a new connection. Again note that this is very early development but should be functional in non-error cases. If you are using a CM for AWS, then we probably broke something...please do let me know wither way. I didn't setup this myself. I supose i'm using a Connect Manager because i have an AWS registration code. Can you confirm which version of the client you are running? Just type pcoip-client -v at the command line. @luis I had a chance to test out your docker files and it worked for me with a couple of changes. There is a "run docker ..." command in the docker file...that should not appear in the file...it should just be the command you use to run docker. You also need to map the network to the docker container. This is likely why brokering did not work. So just add --net=host to the run docker command. Finally when the client is up and running looking for the Host Address or Code, enter the registration code for the AWS workspace. Have a try and let me know...I'm going to switch to your setup using docker for the next few days to see if I find any other issues. Yes that docker command doesn't belong in there. Something went wrong with my copy and paste. I will try with the net host option and see if it produces more consistent results. In any case I've been using it for hours without a problem. I've tried full screen, resizing and multiscreen without a problem. Some visible glitches during resizings but other than that worked perfectly. The workspace is linux as well. I'm seeing the same error message ("The message is missing some content") both from within Docker and from outside docker while trying to connect to an Amazon workspace using PCoIP 3.9.0-dev9. Any ideas? BROKER :Locale is "en_US" (English), unchanged. BROKER :pcoip_client locale file wasn't successfully loaded. BROKER :QT system locale file wasn't successfully loaded. BROKER :Dispatching to Dialog Authentication flow. 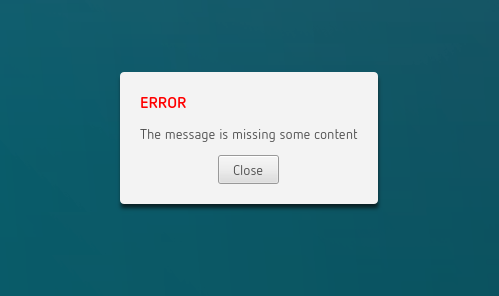 BROKER :Authentication Error: The message is missing some content. CLIENT :Pre-session initiated application exit. Hi @obadz obadz, we were able to reproduce this problem and I have a workaround while we track down what broke and get a fix ready. The problem appears to be that the registration code is corrupted when stored to disk. You can check that you are seeing the same issue by creating a new connection which should work because we are not reading a corrupted registration code from disk. Any saved connections that were created prior to this bug being introduced should also work fine (which was my case here initially). To workaround the problem you can edit the .ini file and fix the registration code. If you edit ~/.config/Teradici/PCoIP\ Client\ Connection\ Info.ini, there is one line for each saved connection. Find the line for the saved connection you want to fix and enter the correct registration code in the second comma separated field. Here is an example of one of the lines. Just replace WSbad+CODE123 with the correct registration code. Please do confirm if this workaround resolves your issue. I'll let you know when we have a development build you could test a fix out in. Thanks @Bruce Jenner. I'm afraid that did not work for me, the WS* registration code in the .ini file looks identical to the one that Amazon E-mailed me. myuser, mydomain, and mylongnameforthedesktop are all empty however. Does that matter? Hi @Bruce Jenner, do you have any ideas re what my problem might be? Also, do you have any dummy test servers that can be used to make sure that the issue isn't on the server side?